Are your insides rotting away? 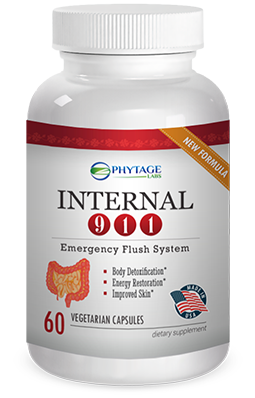 A new breakthrough from Phytage Labs LLC, Internal 911 is a complete cleansing and detox system engineered to help clean you from the inside - out, assisting in the elilmination of harmful toxins. It began with our highly acclaimed phytoceramide based skin care supplements. Now, we’ve formulated some of the most life changing gastrointestinal supplements to ever be developed. From gastrointestinal cleansers to gut improving probiotic supplements, you’ll gain health with confidence, knowing that our PhytAge Labs supplements provide you with only the most pure, most organic health ingredients available in every supplement caplet. Internal 911 is an internal cleansing supplement designed to help you clean and purify your gastrointestinal tract. Packed full of 10 powerful unique ingredients not found in this combination in any other similar formula. Internal 911 is specially designed to have a gentle, 100% safe laxative effective on your colon, resulting in a younger feeling, healthier, lighter you.